Watching Ireland's 6ft 3in wing Jacob Stockdale set a try-scoring record in his first Six Nations, it's easy to imagine him running through hapless opponents throughout his school days. Not so, according to his former coach at Lisburn's Wallace High School. Derek Suffern said the now 21-year-old was in the B teams and "the fringes" for much of his school career. Indeed, his coaches had to persuade him to stick with the game as he considered quitting due to his small stature. "Jacob, in first year, would have been a very talented player," said Mr Suffern. "But as he went through the years he didn't excel early after his first year - he would have been on our B teams and on the fringe of things. "It wasn't until one summer he came back and had a huge growth spurt in the lower sixth year and we played him on the wing in the first game - I think it was against Ballymena. "He scored two or three tries in that game and we all looked at each other and knew we had a player then, but he certainly wasn't a player early." 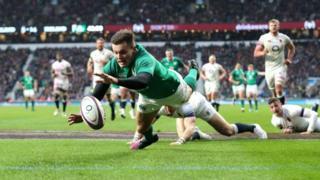 Stockdale's seven tries in Ireland's Grand Slam mark him as one of the brightest prospects in rugby. And while Mr Suffern said "the world is now his oyster" it could all have been so different as Stockdale contemplated giving up the game he loved. "It was around medallion time - under-15 sort of year and he wasn't growing," Mr Suffern said. "He was very good in first year, but he just wasn't growing and I think the sport lost a wee bit of the enjoyment factor. "But we managed to keep him going and here we are now. "Once he got his hunger back and he realised how good he was, he certainly worked hard. "He's certainly working hard at the minute and that's why he's getting his rewards. "The school takes a lot of pride in that." Stockdale was born in a Presbyterian manse in Newtownstewart, County Tyrone, where his father Graham was a minister. The family's love for rugby ensured Jacob became acquainted with the game at an early age. "He certainly got a rugby ball from his grandpa when he was very young," said Graham Stockdale. "His grandpa was a rugby player and I was a rugby player, so it's one of those things that seems to have been passed down the generations." Despite his meteoric rise, the Ulster wing has been praised for managing to keep his feet on the ground, except of course when diving off them to touch the ball down over the try line. "Jacob is generally a very laid back big fella, I know nerves get to him, but he's just excited for every game," said his father. "He doesn't take anything for granted, there's lots of players pushing him and hopefully that will bring the best out of him." With 11 tries in his first nine games, the sky is the limit for 21-year-old Stockdale. Thank goodness for that late growth spurt - and some persuasive coaches at Wallace High School.